During the years my children were growing up, there was a sign we traveled by often on a neighboring road. It was nailed to a tree in front of an unsophisticated country home. The sign was made from a rough piece of plywood with hand-painted red-lettering that simply read: Large Wigglers. We got a big chuckle out of it each time we passed it and usually made funny comments about how that sign could be so misinterpreted. To me, it was a gentle acknowledgement of our move from the big city to a more provincial area. Well, that was then and this is now and as the city moved toward us, eventually the little house was removed to widen the road and the sign was gone. I’m reminded of that sign often as I come across the large wigglers that seem to thrive here at Hoe & Shovel. Lately it’s been my pursuit to purposefully transfer handfuls of them to the soil of my raised beds where I’m growing veggies. Sure the wiggly helpers would find my vegetable garden eventually but I’m on a mission to help the process along. 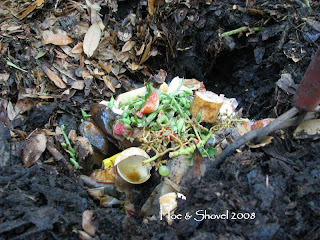 While adding my kitchen cuttings to my compost pile it is rather an easy task to exhume a dozen or so at a time from the rich organic material. In reality, all of the squirmy helpers are not large. They can be found in all sizes. Once unearthed they wriggle their way quickly back into the deep darkness and safety of the soil. Why earthworms? I’ve listed here just a few of the benefits these simple creatures provide to any garden. - removes litter from soil surface - earthworms eat the litter and leave the nutrients in their castings for plants to use as a natural fertilizer that is non-polluting. - earthworms chelate nutrients, making minerals available to plants that would otherwise be in a form that would be chemically unavailable. - plant growth stimulants such as Auxins are produced in the castings, these hormones stimulate roots to grow faster and deeper. - worms neutralize soil pH, cast analysis shows that the product coming out of the back end of a worm is closer to neutral than what goes in the front end. - nitrogen fixing bacteria live in the gut of earthworms and in earthworm casts and higher nitrogenase activity, meaning greater rates of nitrogen fixation are found in casts as compared to surrounding soil. 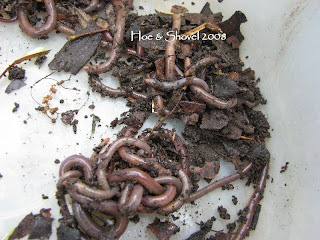 - Many species of earthworms actually eat the bad microbes (fungi, bacteria, etc.) that are plant pathogens and in the process they also increase the good beneficial microbes. I knew they were good for the soil, but not the exact details. Thanks! And they are so beautiful. I'm thinking of knitting mine some mufflers. They look cold don't they? You were speaking of old sayings like Large Wigglers. I bet not many people have heard of knitted mufflers either. If I travel the back roads, I can still see a sign for Large Wigglers. Thanks for the worm education. Did you build them seperate sleeping quarters. Meems,oh, I love wigglers. Large ones, small ones, and all sizes in between. We must have decent soil here, because there are bazillions of them. Whenever I find one on the patio or walks, I get them back onto the soil. It's sad when they can't get back on their own and die and dry. George helps me find them. Oh... Meems, I do envy you that handful of earth worms!! However, these busy little workers do have predators other than birds. Their numbers can be completely wiped out by the New Zealand Flatworm. I will not spoil the positive tone of your comments. I have had first hand experience of gardening with and after flatworms and my plants are surviving so I am especially thrilled to see the odd earthworm! There is no point in adding earthworms to my garden as this will only feed any remaining flatworms and so it will continue. gardeness, there are so many more details- I only listed a few - but oh my I didn't know either the extent of their goodness. Thanks for stopping by Hoe & Shovel - I took a quick peek at your site and we are at opposite corners of our great country. I will check back to peruse what you've created in your front garden a little later. Anna: well, it was 85 degrees that day so cold they were not. Even though they do appear to be huddled up for warmth they are looking for darkness I believe. I can imagine you would still see signs in your part of the country and thank goodness for it. What a great post. While I'm a bit squeemish about handling my wigglers, I cheer them along in my garden. You probably have lots of robins at your place since you have so many "wigglers". I usually see quite a few earthworms here too. I like your "Hoe & Shovel Garden Facts for curious readers" it is really useful. I, like many reader, read lots of blogs and this reminds me of who you are and where you are. I usually have to hunt for locations etc. While a lot of bloggers have similar information I hope more will add follow your lead and put it right at the top. I was hoping you had been able to rescue the sign. nancy: I'm beginning to think they are one of the most useful creatures God gave us... I haven't fully decided. melanie: It's one of those things I start out doing with gloves on but soon I have flung them aside for the use of my agile fingers. I've gotten over most of my squeamish ways after kids AND gardening. robin: I got this out of my Birds of Florida book... Although it is a well-known habit farther north, American Robins are seldom seen feeding on earthworms in Florida, probably because worms are scare in sandy soil. 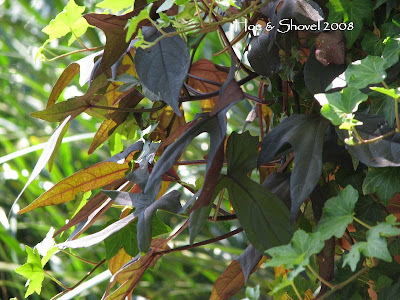 Instead, robins feed heavily on berries, especially those of holly and Brazilian pepper. American Robins only visit this far south in winter.I've only seen them rarely none the less. sigh. SA: I'm glad you like that feature. What you mentioned was exactly why I created it.So often I have to search to find the region and stats for a blog and it makes it more difficult for me to relate to quickly... that's just me though. gail: Thank you.Finding these fascinating creatures just makes you feel like things are working right underneathe it all....doesn't it? The rain does seem to wash them out at times. I have seen them at the bottom of our pool after a heavy rain. Actually, we didn't rescue the sign but a quaint little produce market further north on the same road managed to. The first time I walked in and saw that sign nailed to the wall behind the register I was thrilled. meems .. great post .. even though I have wormaphobia .. I give them the credit and respect they deserve .. then I run screaming if I touched one without a glove .. LOL .. sorry .. wormaphobia is hard to control and especially irritating for a gardener who knows better ... BIG sigh ! Meems - I'm so jealous of your bounty of worms! I get so excited when I chance upon one in the soil - but mine are few and far between. What wonderful info on their benefit too! I knew I wanted them but didn't have a clue as to the many reasons why! Seeing your wigglers reminds me of a time I got a load of cow manure. I shoveled and shoveled then sat on the tailgate to rest. I heard this sound. I was out in the country with no one around. I first thought it was a bird nearby. Finally it dawned on me the sound was coming from the truck bed. There were millions of earth worms in the pile of manure and I had gotten them all stirred up shoveling through their pile. It was a weird moment I will never forget. Joy, It's okay --at least you're honest about it. As long as they do their duty (ha-ha)you probably don't have to touch them. I guess I didn't even consider the wormaphobia aspect of this post... I've gotten so used to handling them. Chey, You're very welcome. Thanks for visiting Hoe & Shovel. Mary Beth, I wonder if you have few earthworms due to your clay soil? I'm not familiar with clay but I would think it wouldn't be a happy medium for the worms. I bet where you've amended the soil in your new lasagna bed they will be attracted to that. Lisa, That's a funny story... not so much as in ha-ha but to imagine earthworms making noise... wow. Sophie, just you saying "let's go fishing" threw me back in time when my dad would absolutely use earthworms to fish... weird how that happens. I hadn't thought about that at all when writing this post. Yes, it does take some time to get your E award distributed... lots of links. :-) No pressure though - it's suppose to be fun. Ha! Your post reminded me of just how crazy I truly am. (I loved the info provided by the way!) What makes me so crazy you ask? Well, I used to live in town. After the rain the streets and driveways would be covered in worms. After it started drying out the poor worms would be baked in no time on those black scorching surfaces. I'd run around with a bucket and collect them before they perished and whisk them off to safety. My neighbors used to do a lot of eyebrow raising at me.